Cyber Monday is just around the corner! And while some look at Christmas as the best holiday, we have to say, nothing gets us going as much as some good Cyber Monday deals. It is the best day to find some great Christmas presents on a budget or to treat yourself to some brand-new electronics, like a shaver. 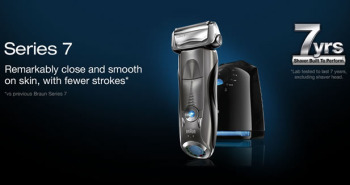 So, if you were to buy a new shaver for your man or for your dad then grab this opportunity. Now is not the time to procrastinate on those presents! We gathered the best deals for you and included a little review with each shaver to help you through the process. Cyber Monday only happens for one day in a year, so there is really not much time to waste. This year it falls on the 26th of November, the Monday following Black Friday. 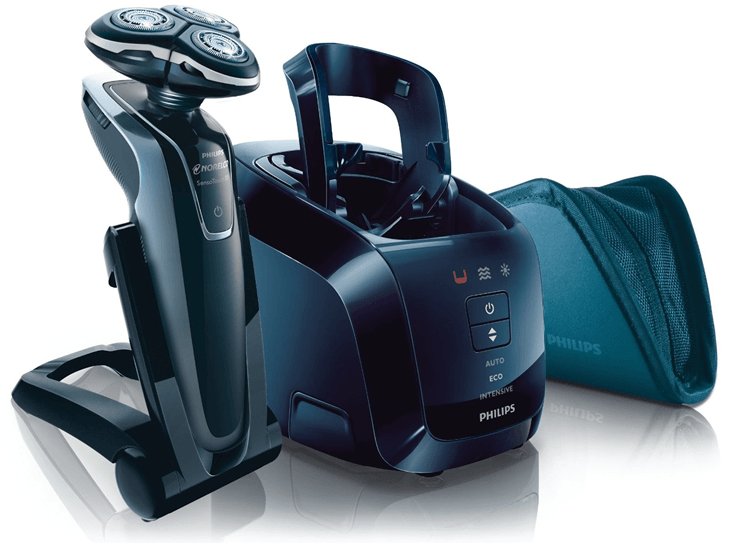 Panasonic, Braun and Phillips…the triumvirate of shavers. These are the ones which you can’t go wrong with. Still, it is best to tailor a shaver for one’s specific needs and that is why we made this list. We understand that there are so much variety out there that it is hard to know where to start. So we gathered the 10 best electric shavers for you to choose from on this year’s Cyber Monday. A careful selection, so that you only have to decide which one suits your needs the best. 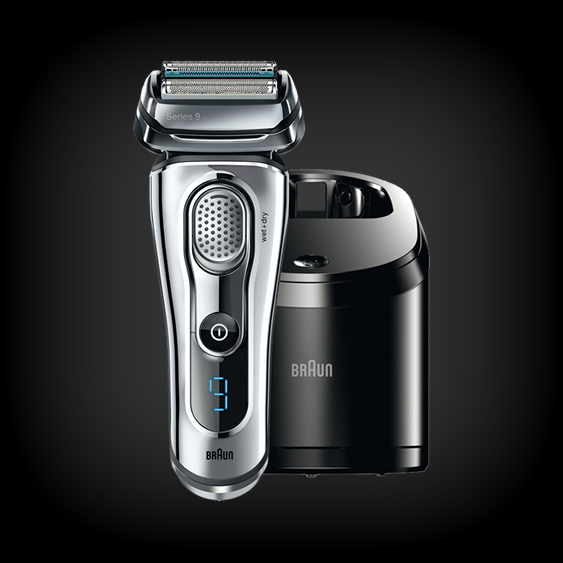 The Braun Series 9 Shaver suits those who like a sharp, distinctive look and a machine that is low-maintenance. 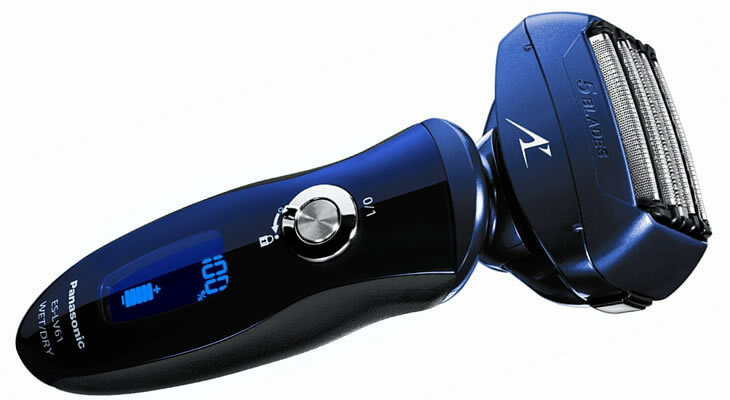 The sleek shiny chrome finish and the blue LCD panel on the front gives this shaver a beautiful modern look. A Braun cleaning and charging station is also included that does all the maintenance work for you. If you’re a man who likes to show off your possessions, this is a good choice for you. The cleaning and charging station is also perfect for those who don’t have a lot of time to get ready in the morning. The shaver inserts foil-head down into the charging station. With the press of a button, it will clean, lubricate, dry, and charge up your shaver. Note that unlike many other cleaning stations, the Braun cleaning and charging station also dries your shaver. It’s great to remove your shaver from the station and have it dry and ready to go for the next day. Like most shavers today, it has been designed to provide a clean, smooth shave that is free from irritation, whether you use it wet or dry. 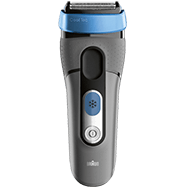 Another shaver worth checking out in the Cyber Monday deals is the Braun Series 7 men’s shaver with cleaning and charging system. While the design is not as sleek as the Braun Series 9’s, it still has a great look and what it’s lacking in design, it makes up for in it’s other features. The shaver has different power levels which is ideal for men who like to control the intensiveness of their shaving depending on the day. It has a turbo mode for days when you let your beard grow a bit thicker and sensitive for a daily trim. This shaver has been designed to shave with fewer strokes and provide for less skin irritation. The clean and charge station takes alcohol-based cartridges to get the foil head clean and sterilized. You might have realised that the first two shavers on the list were foil-head shavers as opposed to rotary-head shavers, but that doesn’t mean that they are better in any way. It is really just a matter of preference and you can find both foil-head and rotary-style shavers on offer during Cyber Monday. 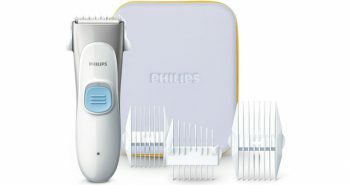 The Philips Norelco 9700 is a rotary-style shaver and it comes in a matching kit of shaver and cleaning station. The Phillips Norelco 9700 has three different speed options from slow to fast. There is also a facial cleansing brush which is unique, as most other shavers don’t have one. It can be used as an exfoliant to clean and soften your face, just add soap or lotion. Whether you shave wet or dry, this shaver will be able to tackle up to a three day old stubble. Can’t choose between a foil-head and a rotary-style shaver? 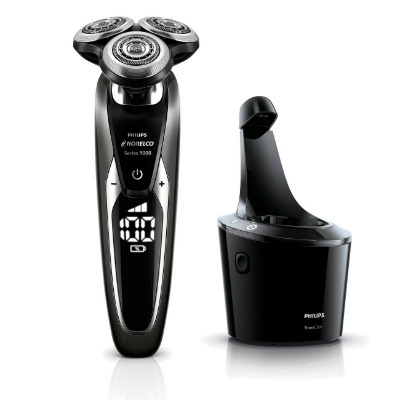 Good news is, you can have the best of both words with the Panasonic ES-LV81-K shaver. It is a foil-style shaver that has the flexibility of a rotary-head shaver. 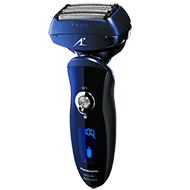 Its multi-flex head moves around in different directions easing your shaving experience. So, if you are indecisive, it is worth looking out for this one in the Cyber Monday deals. The blades are made of hypoallergenic steel so they don’t cause additional irritation with allergies. The head will smoothly glide over your face for a clean close shave. 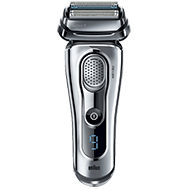 This shaver is made with a powerful high performance motor that delivers 14,000 cuts per minute and 70,000 cross-cutting actions per minute. If you want a faster and more efficient shave, this may be the shaver for you. The clean and charge station makes maintenance simple. This one will also clean and dry your shaver, and charge it up for the next morning. Cyber Monday also has deals on individual shavers, so if you don’t want to purchase a full kit with a cleaning station, you don’t have to. There is no reason to go into extra expenses if all you want is a good quality individual shaver. 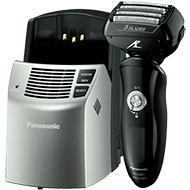 The Panasonic Arc 5 LV65-S only includes the shaver and it is a high quality machine with various good features. A nice, sleek design and a foil-style shaving head with five blades. The front of the shaver has a detailed LED readout panel to tell you battery time, low battery, and time for maintenance. This shaver also has the fast 14,000 cuts per minute linear motor to provide fast and efficient shaving. 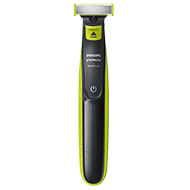 The Panasonic Arc 5 LV65-S shaver can also discern hair length, so it will automatically speed up or slow down based on length and thickness. This way, you don’t have to keep on pressing the power button up or down. The blades within the shaver have been precisioned at a 30 degree angle. The head of this shaver also has Multi-Flex and pivoting ability. If you’re shopping the Cyber Monday sales for a shaver that really works well, but don’t care a lot about flashy looks, the Braun Cool Tec shaver might be the perfect choice for you. The most distinctive feature of this shaver is the patented Cool Tec feature which no other shaver has. When the Cool Tec button is pressed, the shaver’s head will actually cool down so your face and the shaver stays cool to the touch. This is achieved with the addition of an aluminium cooling bar. 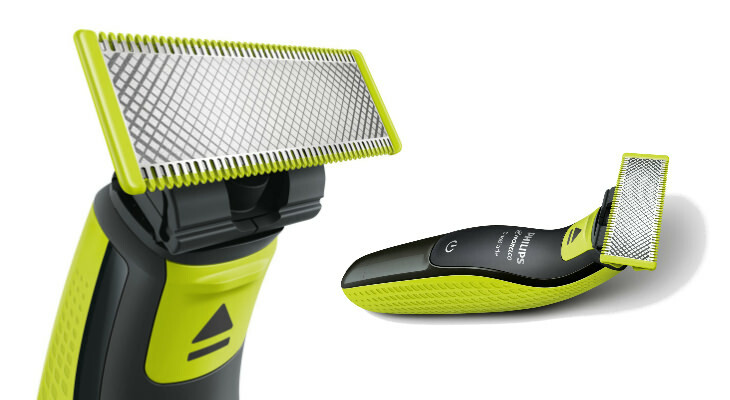 The head of the shaver has been designed with a 3-stage cutting system. Each of the cutting elements move independently of each other. If you have hairs that lay flat against the skin, the SensoBlade will capture hairs that grow in different directions. 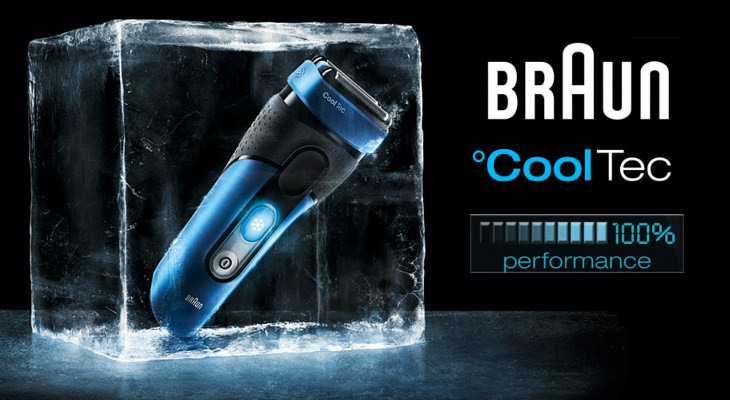 Like the other shavers included in this list, you can still use the Braun Cool Tec wet or dry, and with shaving products. The shaver has a precision trimmer that most rotary head shavers lack, so if you need to trim moustache, beard, or sideburns, you’ll need to at least buy a foil-style style shaver or a rotary that has a clip-on attachment. Cyber Monday is on of those events during which those who usually live on a budget can finally allow themselves a bit of luxury. 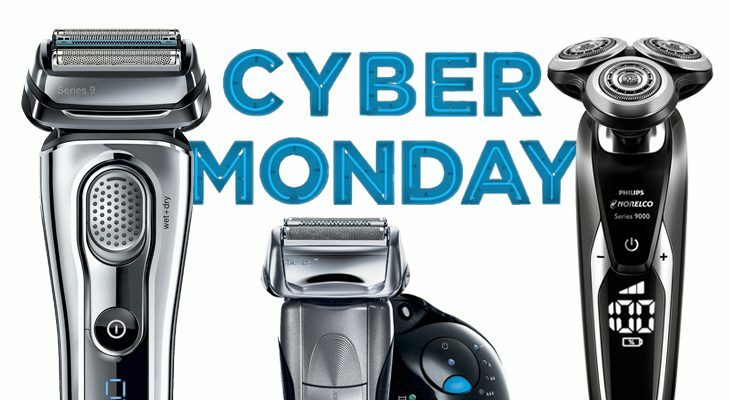 If you have always dreamed of a premium style shaver then Cyber Monday is the day when you can finally make your dream come true, for a better price. In the premium category, the Philips Norelco 1250X/42 SensoTouch is the one that we would really recommend. It has a distinctive high-end look with both the shaver and the cleaning system having a sleek back design. The shaver is rotary style with a flexible head. 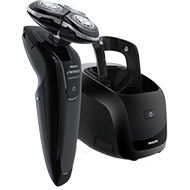 Thanks to the Philips Norelco 1250X/42 SensoTouch’s ergonomic design, this shaver sits comfortably in your hand and it is easy-to-use due to having the handle on an angle. This shaver offers 3-dimensional contouring around every angle of your face. Built within the shaver are special channels that can grasp longer hairs, in case you haven’t shaved for a few days. There are also slots that snip off the normal hair, and minute holes that are designed to trim off an even stubble. Ideal for men who like to shave more than once a day. 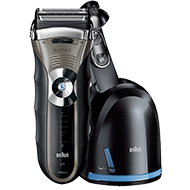 The jet clean system will clean your shaver, lubricate it, and charge it. Unfortunately, it doesn’t have a drying system, so if that is a feature you can’t live without, then we wouldn’t recommend this model. 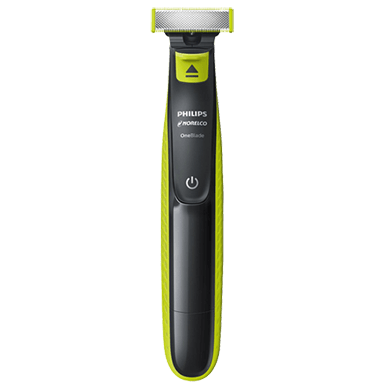 If you are looking for a shaver which is more like a facial trimmer this Cyber Monday, then the Philips Norelco OneBlade Hybrid is the right choice for you. it acts both as a shaver and a facial trimmer. Ideal for men who have to maintain facial hair such as moustache or beard. It can also trim easily around eyebrows and sideburns. The OneBlade is designed a lot like a powered safety razor. It can be used wet or dry and has a dark black and lime green colour with a power button in the front centre. Like with razors and safety razors, you’ll need to replace the blades on a regular basis. This can mean around three or four months depending on usage. The OneBlade makes it simple to edge, trim, and shave any length of hair. There are snap-on combs so you can shave right over your facial growth without fear that you’re trimming it too short. There are three different hair comb sizes or you can simply use the trimmer without the combs and then it works as a regular shaver. However, if you are looking for a regular shaver we would recommend something else in this list. 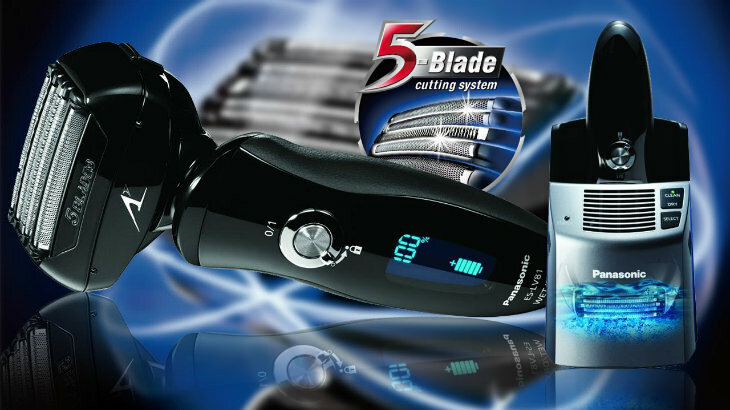 Only choose this product if you would like to use the razor and trimmer features. The trimmer can also help you to line up your angles, so that your beard is evenly shaped on both sides of your face. Many men love a rotary style shaver but not the higher costs associated with them. Good news is, now you can pick up a great rotary-style shaver for a better price since it’s Cyber Monday! 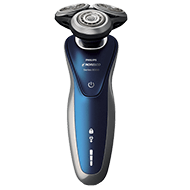 The Philips Norelco 8900 with its dark blue and light grey body-casing can be used wet or dry. Its shaving head can move in 8 different directions, so you’re still getting a great shave that will cut up to 20% more hair than other shavers. This shaver has been made with Aquatec technology, keeping it waterproof even if you drop it into the sink. It will still work well when used dry too. 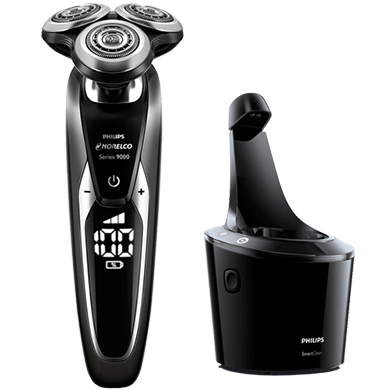 Besides trimming more hairs, it will also trim 30% closer to the skin than other shavers in its line or other brands. Even though it can trim so close, it will still provide a safe and comfortable shave so you experience less irritation. There is also a beard styler with five different length settings so you can trim to the desire length. Like the other shavers in its line, it has an LCD readout panel on the front of the shaver to tell you how much electric charge is left, and when you need to do your maintenance. If you really want a cleaning and charging station, but hate the high costs, Braun has a solution for you. 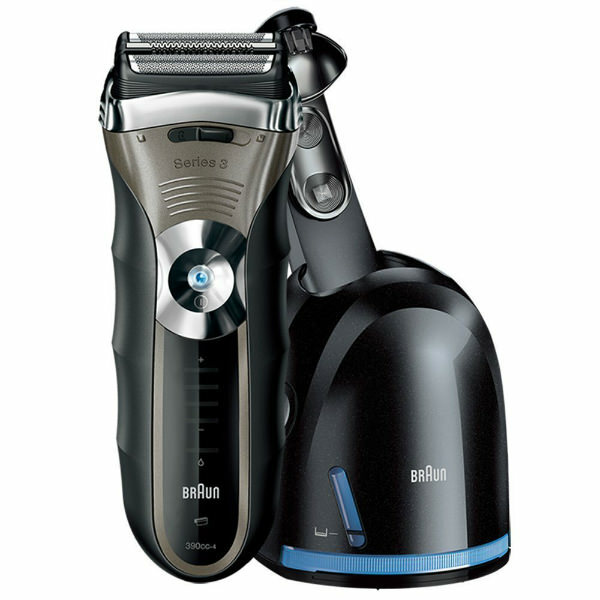 You can find the Braun Series 3 390cc shaver amongst the Cyber Monday deals. The whole kit is under $150. Both the cleaning station and the shaver are black with blue indicators. Only you will know how little you paid! This shaver offers 30% less skin irritation than if you shaved with a rotary-style shaver, even if it had built-in skin conditioners. This shaver is still waterproof and can be used wet or dry. 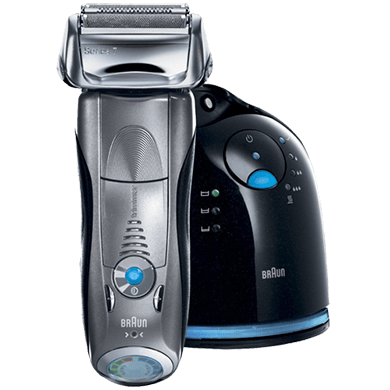 The Braun Series 3 390cc shaver will be effective even if your beard growth is less than one day old. And it will work just as well in a 3 day old beard. The back of the shaver has a precision hair trimmer allowing you to trim your sideburns, moustache and beard. Once you’re done shaving, you can place the shaver head down into the clean and renew system and press the button. 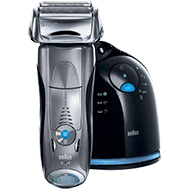 Your shaver will automatically be cleaned, lubricated, and charged. Note that it doesn’t have the function to dry. Have you made your Cyber Monday sales shopping list? Now you can quickly go online the day and shop for the best Cyber Monday deals. Once your brand new men’s shaver arrives, you’ll be guaranteed to have an amazing shaving experience every day!